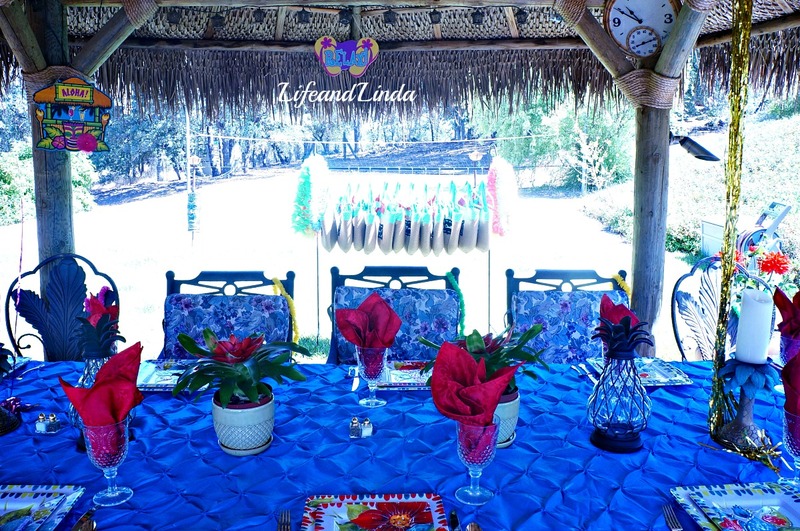 When I decided to have the luncheon for the ladies down by the pool, I knew I wanted to make something special for each lady. I always try to have party favors for each event with the theme's colors. I found the woven tote bags at Target in the Dollar bins. They were $3.00 each. I traced this pattern onto the chalk fabric and cut it out with pinking shears. 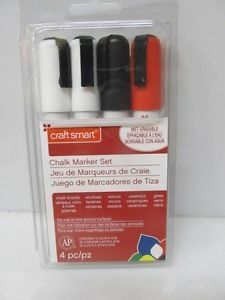 I use a chalkboard marker to write the names....I found some at Michaels. They were cheaper on Ebay. I decided to hand sew them on each bag with a coordinating ribbon to give it a decorative look. 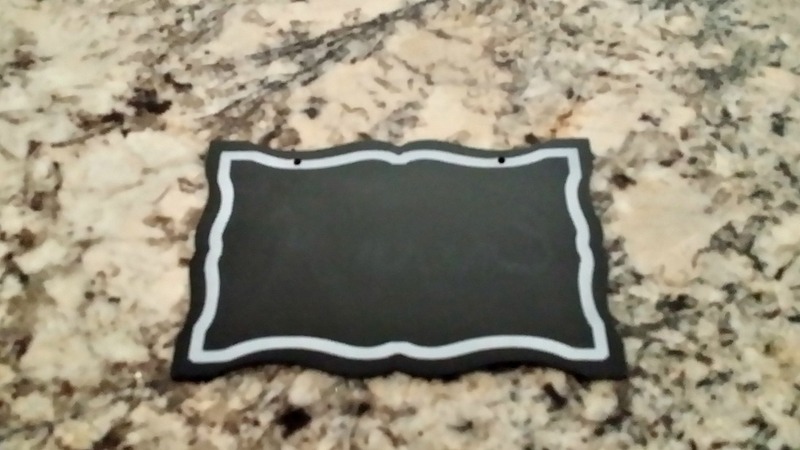 I used a curved chalkboard template for the design. Use a hole punch to make the holes for stitching the ribbon through and a large needle. You can find the ribbon, flowers and some colored burlap at the Dollar store I layered the wide burlap with two other ribbons and tied a big bow on the handles with twine. I decided to hang the tote bags on two shepherd hooks and a curtain rod. I bought turquoise hangers at Ross and hung each bag. There are colorful leis on each side for the ladies. When they arrived, I told them to find their bag and hang it on the back of the chair where they want to sit. 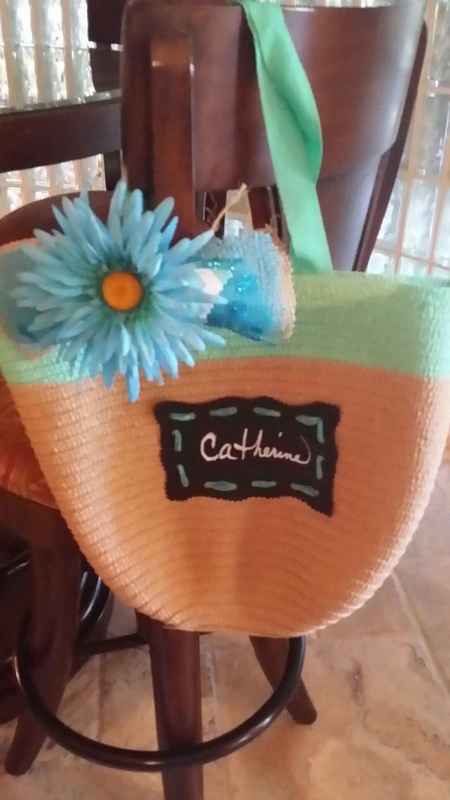 My mother loved the tote bags and wanted to make some for her group for the Red Hat Luncheon coming up. She came over today and we worked on them together. We also made the cute Nutter Butter flip flops in the red hat colors, red and purple. Linda I would have been delighted had I been attending the luncheon. Such a treat. Hi Linda, I do wish you lived closer, you would be invited...Happy weekend. So special! I bet the flip flop treats and the tote bags will be a big hit at the Red Hat luncheon, too! Hi Debra, I certainly hope so. I know my Mother was thrilled when we were making them. I hope you make some Michelle. they will be a hit! I would have been squealing!! so cute! The bags are fabulous! I'm sure everyone at the lunch was thrilled. The tote bags turned out so cute, Linda! I have some of that chalkboard fabric and love it for projects. You're so clever and I like how you used Dollar store trim and the totes from Target. What a cute idea...bet your guests loved them, Linda! I have a chalkboard marker..but have not seen the fabric yet..I just came back from Maine and saw a Jo-Anns..next time! Thank you Monique. I will be fun to see what you make. Happy weekend. I love this idea! Lovely! Yes, I love this idea too. You are very creative and it would be so lovely to receive the these in one of your parties. Thanks Ginger. Great receiving a compliment from you. 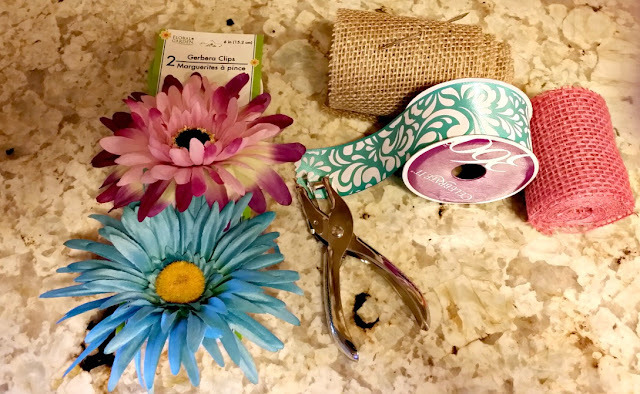 A lady who excels in crafting. How cute were those! I love that your mom came over and you made more for her party! These are so pretty. I spent a few bucks ordering myself a monogrammed tote! I like to give out favors, too. Your luncheon looks fabulous. Wish I was there. 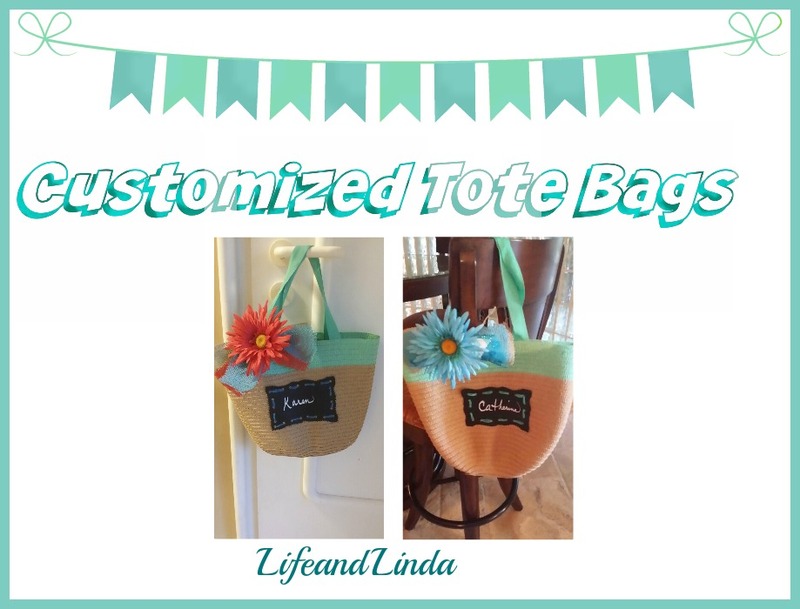 Hi Linda, love these totes. They are the cutest and I know the girls went crazy for them. Such a grand idea. Thanks for sharing your steps. You are so very talented. What a great gift for your party! You did a great job customizing them. The chalkboard tag is such a sweet touch. Linda, thanks for stopping by. You are Awesome! I don't know if I made the right adjustments for the widths. I bet your friends felt so special with your lovely job of hostessing and the sweet totes! These bags are so cute, how nice to spend the day helping your mom with hers for her party. That was really sweet. Have a nice week-end Linda! Linda, these are absolutely adorable. Your attention to detail made them so special and your friends were treated to a very unique day. I'm glad I get to count you among my friends, sweet lady. You are so caring and considerate. 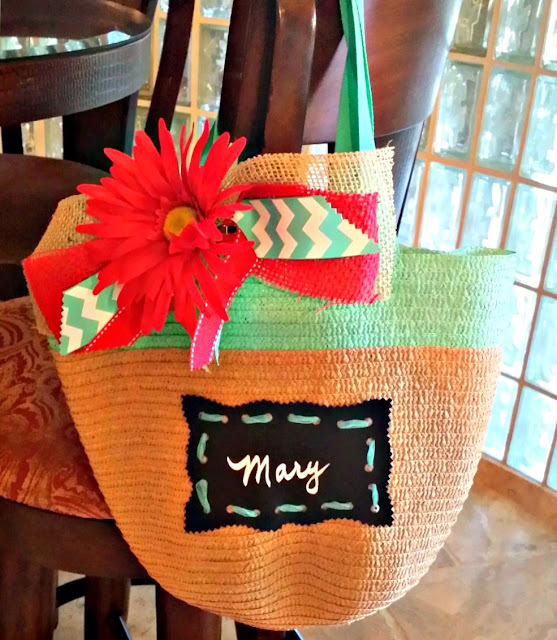 Those personalized tote bags are the cutest...I am sure they were a hit at the Red Hat Luncheon! Totes are, probably, one of favorite favors for friends ever. I Love it. They make me smile and yours make me sigh of envy and admiration towards your amazing crafty side. Next time I want in that party ;) pretty please??? Oh I wish I could have come to that. The bags look amazing!! That is an adorable idea. I'm always needing a door prize or party favor for my quilt retreat gals. I'm gonna have to find or make some bags and use that chalk fabric. I was just at Joanne's too. I guess I'll just have to go back.